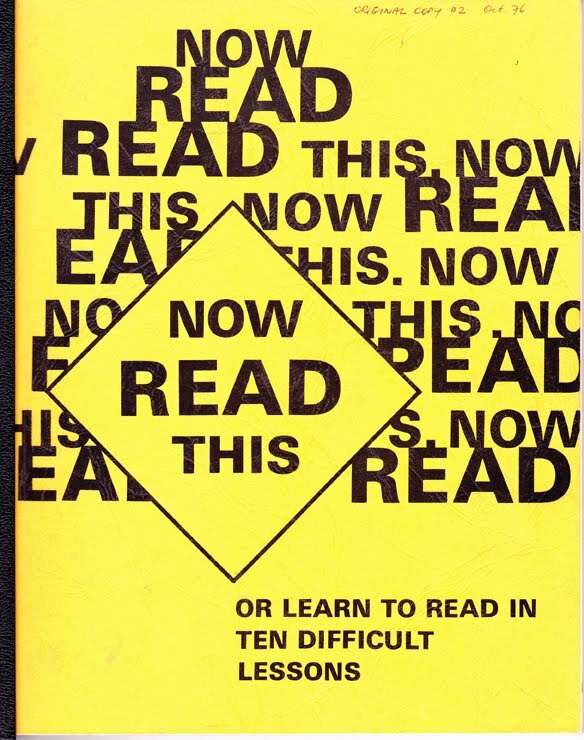 Now Read This is a complete literacy programme to help adults and young people to learn to read and write English. It is suitable for institutions and home tutoring. 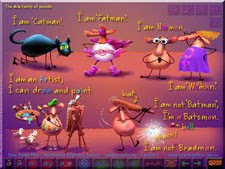 Once the programme is installed on a computer a learner could even progress by themselves ... because the programme is completely self explained in the sound track. "What I like about it is the 'self help' interactive way one can sit down for half an hour in a spare moment and go through some of the lessons in a repetitive way to reinforce stuff already approached." "... my student fully appreciates the importance of learning all the sounds." "... my opinion is one of excellence and my student feels the same way as he sits down regularly every morning to work through the initial stages." "... at the age of 65 ... he never had the fundamentals taught and so realises that he has to start at the beginning to understand and pronounce the unfamiliar words." over the past decade we have worked to make a digital literacy programme that closely follows a method that Jon's uncle worked out way back in 1956 when he was a school teacher. From 1956 till now that programme has been in constant use!!!! In schools and in adult and migrant education centres. 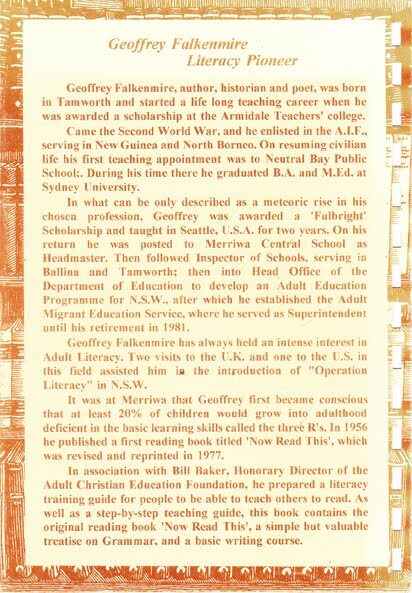 Geoffrey W Falkenmire originally called his programme "Now Read This - Learn to read in 10 difficult lessons" GWF has a great sense of humour. To find out more about this very inspiring teacher listen to his interview with Margaret Throsby on Classic FM. Now Read This was re-printed and re-titled "Highway to Literacy" in 1984. The books are now out of print, but this digital version has it all, and more. contains 567 interactive units. Each one covers a different topic. It is suitable for complete beginners, teaching the learner to read and write the alphabet. It caters for learners at every level, even very advanced learners with in-depth information on grammar, parsing and analysis, poetry and many other topics. Every unit has a corresponding printable page that can be reproduced and used as a worksheet. This means that Now Read This also contains 567 black line master reproduceable student worksheets. 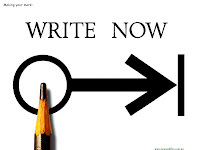 Everything you need to know about writing: how to sit, how to hold a pen (for left and right handers), how to form each letter. All included in NOW READ THIS. This document is a near facsimile of the original. 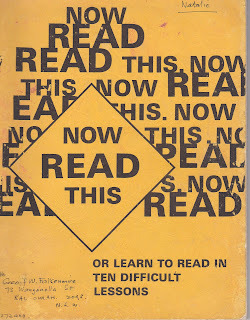 It is a guide for teachers using the original Now Read This programme. Unlike the original book, this document does not contain a copy of the programme. A facsimile of the original Now Read This will be available soon. That echoed down the stairs. Be patient - I can do much worse. I bought the whole damn lot. Crash and splash and crunch. As they munch their lunch? My students have real need. The things that must be done. The teacher has to bend. And let me do it well. Or else I'll surely burst !! - some things never change! Many units of Now Read This have lists of words that have the same sound. 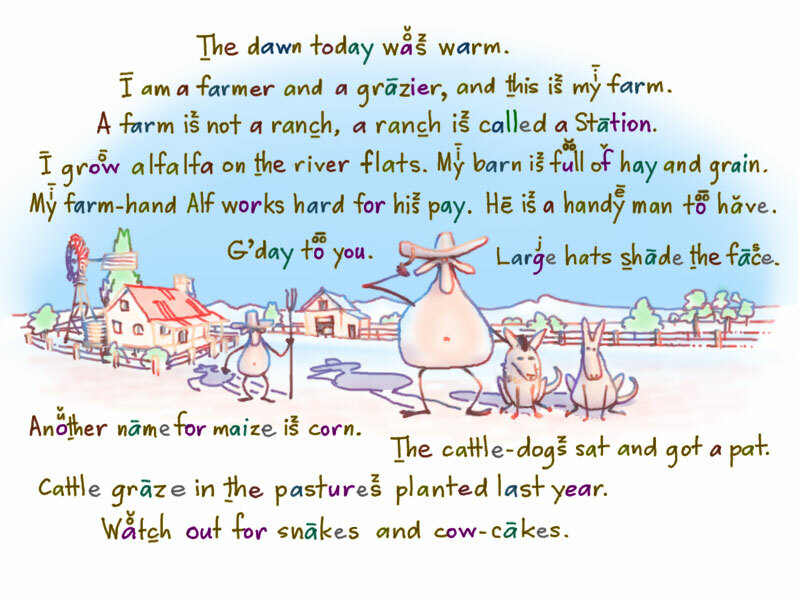 Each word is read out aloud and highlighted so that the learner can follow easily. The learner can interrupt this by clicking on a word to hear it alone. 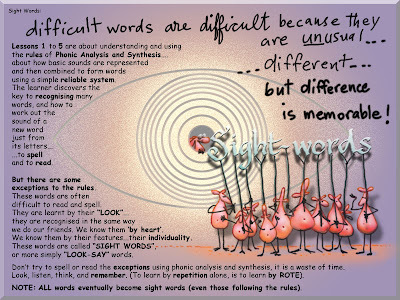 In each unit the easier words are on the left and only these need be learnt by the beginner. The other words are for more advanced learners. The tutor should supervise to ensure the learner is working at an appropriate level. This coloured image gives some idea of what this unit is like. 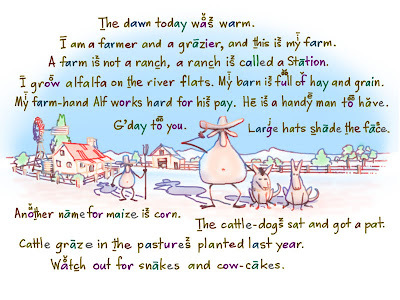 The writing is read aloud to help the learner to understand what this lesson is about. 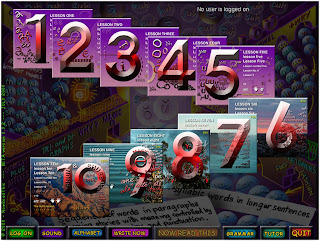 The buttons at the bottom of the page allow the user of the program to go to other pages in Lesson 10. Throughout the program, the green buttons will take the user to the next or previous units as set out in the program. The back button will take the user back through the units that they have been looking at. 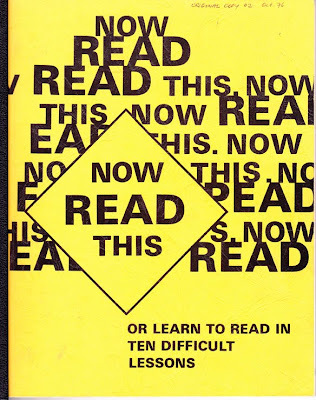 This is the printable version of the introductory page to Lesson 10 of Now Read This. Every interactive unit in the program has a corresponding printable page. These are instant worksheets or homework or revision sheets. Click here to see a list of all of the units that are in this extensive programme. Learn at home, be a home tutor, use it in a classroom - there really is something for everyone. 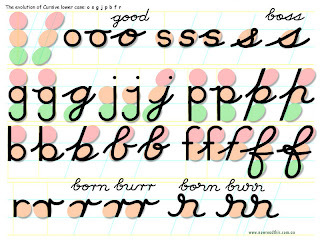 This is the cover for the printable units in Lesson 10. 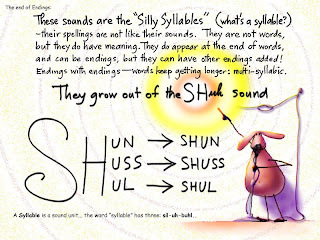 These units look at words that end in sounds like shun, shuss and shul. These poems are the first chapter of a book of poetry by G W Falkenmire published in 1994.The book is called "Verse you can read". 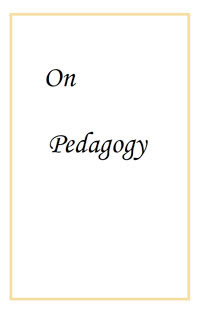 This chapter is "On Pedagogy". '"These are poems that you can understand. They will make you laugh and they may bring a tear. They will capture and retain your attention. They will not bore you. Read them aloud and be captivated by the pictures they paint." Download 15 poems in pdf format by clicking here. This unit from Now Read This has easy words in easy sentences. The image shows links at the bottom of the page, and the top right corner. These take the learner smoothly to other parts of the programme. They are carefully designed to answer questions that might arise from the reading on this page. And the cards are stacked. Every unit in NRT is interactive on the computer screen, and is also available as a printable page. These are some sample pages from the Write Now section. The cover of the programme from about 1978. But for its own intrinsic worth. Of people who know English well ? 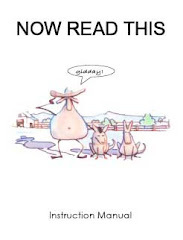 Who read with ease ? And who can spell ? Lesson 4 contains 20 activities that focus on the forth vowel: 'o'. This movie is the second activity of lesson 4. It animates single syllable phonic words that contain the letter o. Clicking on the image will take you to a page where this movie plays. 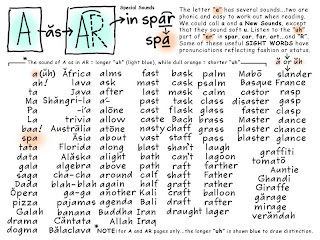 As each word is displayed, it is sounded so that the viewer can get used to how it looks and sounds. It can also be used without the sound for testing purposes. There are a set of 14 syllables across the top of the page. When clicked on, the movie goes to words that contain that syllable. 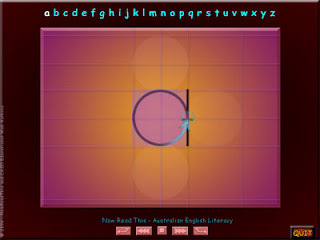 This interactivity allows the user to control the movie and hence their own rate of learning. This is one of 567 units in NOW READ THIS. Why should anything come after? Here’s the church and here’s the steeple. Not too many seasons far off. As a present from her mother. That his crippled foot’s preventing. Make you feel as if you mattered? Click the image to see the movie in a new window. 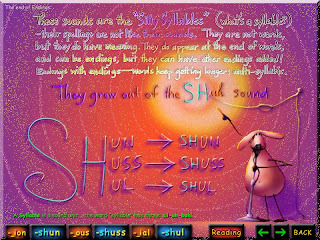 This is a screen shot of an animation in NOW READ THIS. This movie shows how each lower case letter is formed. 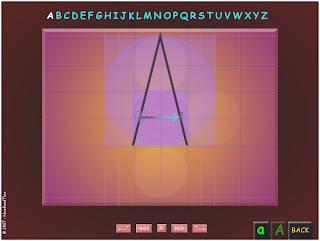 In an attractive animation, students can see the correct way to write each letter of the English alphabet. The movie runs for about 8 minutes. It is in two sections, the first part forming each letter of the alphabet, stroke by stroke. The second part of the movie is all of the 26 letters fading in and out one at a time. This second part will loop endlessly unless interrupted by the user. There are control buttons to manage the replaying, pausing and stopping the movie. An alphabet written across the top of the page is a row of links that allow the user to jump directly to the writing of the particular letter that they click on. NOW READ THIS also has a matching movie that shows the writing of the uppercase letters. Have a look at this movie for free by clicking the image above or clicking here. Your life is ruled by attitude. Until the day you drop. And you'll enjoy the day. 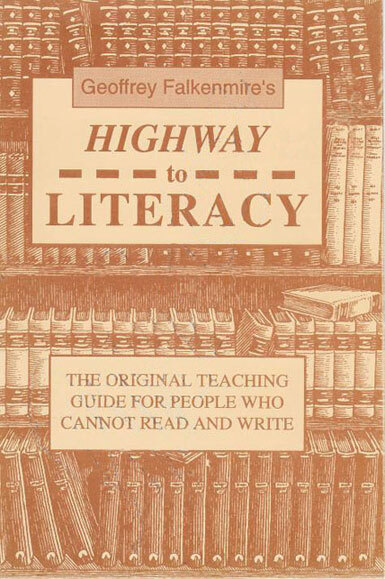 The following is part of the FOREWARD written by G. W. Falkenmire for the version of Now Read This that was published in 1984 and called "Highway to Literacy"
This course is specially constructed so that anyone who can read and write can teach someone else to read and write. It is the result of a lifetime of concern about literacy levels of children and adults. It is the earnest desire of the author that everyone should have access to the printed word. This course is virtually an exercise in programmed instruction - where the progression from a known fact is made as simple as possible. 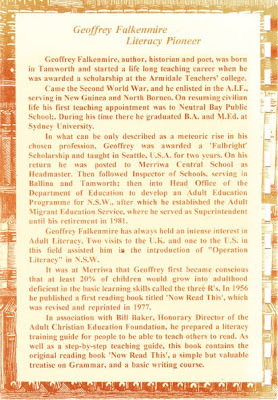 Our digital version of Now Read This holds true to this description. However it is programmed instruction, but the user has control of the programme and can take it in many directions. In this way the programme caters for learners at every level of English literacy and any speed of learning. The title page of NRT with links to the 10 lessons.